On Tuesday I will have the privilege of being the keynote speaker at The Scotsman’s retail business summit, organised in association with the Scottish Retail Consortium. At the heart of my message to delegates will be the new coalition’s commitment to back business to build a strong, sustainable recovery. Scotland’s varied retail sector is one of our great economic successes. However, times are tough. Established retailers are operating in a harsher and more competitive environment. I believe that it will be business with retail at the forefront which will power Scotland out of recession. However, business leaders tell me of the pressing need to restore confidence in the marketplace and among consumers. The government’s first step has been to implement a credible plan to cut the unsustainable budget deficit. Nobody should underestimate the magnitude of this task. The structural deficit we inherited three weeks ago is the largest since records began. Recent events in the Eurozone reinforces the importance of taking action this year. Unless the government tackles the huge public debt it could derail the recovery. We are committed to significantly accelerate the reduction of the structural deficit during the lifetime of this Parliament. Last week we announced £6 billion of UK spending cuts. As we take this first step on the road to restore sound management to our public finances we will make every effort to protect key frontline services and those on the lowest incomes. We will detail our comprehensive plans for deficit reduction in the emergency growth budget on 22 June and in the full Spending Review reporting in the autumn. The action we have taken will help keep interest rates lower for longer, boost economic confidence and protect jobs. We know that paying a share of the deficit falls on Scotland too. Without stronger finances we will be unable to deliver the ambitions we have for Scotland. I want to see a prosperous, business friendly Scotland. 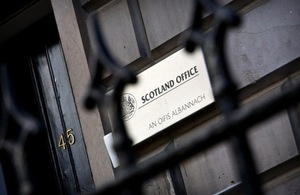 Where it is easier for enterprising Scots to get new companies up and running. Where the barriers which stifle businesses and employment are pulled down. Where a simpler and fairer tax and benefits system actively encourages employment. Fairer taxes will help Scots on lower and medium incomes and realise our longer term aim of increasing the personal allowance to £10,000. A reformed benefits regime will improve work incentives and lift hundreds of thousands of Scots stuck on benefits back to work and out of poverty. We are committed to unlocking all of Scotland’s rich talent. With the aim of supporting sustained green growth and the building of a more responsible economic model. One key ingredient is the provision of affordable credit to our viable and vital SMEs. Which must be delivered by a reformed banking sector promoting responsible banking in a more competitive industry. I believe that our efforts to secure economic recovery can take place alongside a transformation in our politics. David Cameron emphasised in Edinburgh that we have embraced a respect agenda where cooperation not confrontation is key. That means positive engagement with the Scottish Government - because we understand that a good relationship between Westminster and Holyrood serves Scotland well. Respect and cooperation is the way forward. The best path to ensure economic recovery. Retail will play a crucial role in the upturn and this Government is committed to backing business-led growth across Scotland.